Cheri Keaggy can be booked through this site. Cheri Keaggy entertainment booking site. Cheri Keaggy is available for public concerts and events. Cheri Keaggy can be booked for private events and Cheri Keaggy can be booked for corporate events and meetings through this Cheri Keaggy booking page. Unlike most middle agents that would mark up the performance or appearance fee for Cheri Keaggy, we act as YOUR agent in securing Cheri Keaggy at the best possible price. We go over the rider for Cheri Keaggy and work directly with Cheri Keaggy or the responsible agent for Cheri Keaggy to secure the talent for your event. We become YOUR agent, representing YOU, the buyer. In fact, in most cases we can negotiate for the acquisition of Cheri Keaggy for international dates and newer promoters providing you meet professional requirements. Originally from Southern California, Cheri Keaggy began studying classical piano at age seven. Performing in recitals, school talent shows and an occasional church offertory, Cheri grew in her love of music, friends and family while keeping good grades, participating in Girl Scouts and serving in the church nursery. It wasn't until a brief conversation in her high school choir room that she realized there might be something missing. We had a choir workshop one day, and Eddie, this guy who sang bass from another school, motioned to talk to me after class, Cheri says. In the course of our conversation, he asked me two questions. One, Have you ever played in a band? Two, Are you a Christian? It was that second question that really got my attention. While Cheri had thoroughly enjoyed church and held a sincere child-like respect for God, no one had ever asked about her beliefs quite so directly. It was a turning point that beckoned her to take a closer look at where she stood eternally with God. Through devotionals recommended by her new friend Eddie and increased time spent alone in God's Word, Cheri soon understood that God desired a relationship with her every day of the week, not just on Sunday mornings. With a conversion experience she describes as crock-pot Christianity, or a gradual warming of the heart, she settled the issue of her spiritual destiny once and for all. A few years later, the young man, who happened to be the nephew of legendary guitarist Phil Keaggy, popped another important question and the answer was, Yes! After the couple married in August of 1987, Cheri began volunteering in the music ministry at their new church. Soon, she was offered a job as a novice worship coordinator where she found herself looking for songs that would best express the pastor's sermon. One week, when she couldn't find one to match a message on Psalm 91, her husband suggested she write something of her own. That afternoon You, Oh Lord, Are My Refuge is born. 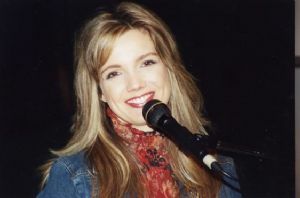 Eventually a recording of her very first songs made its way to Nashville and her debut album, Child of the Father, released to rave reviews in fall 1994, earning her a Dove Award nomination for New Artist of the Year. Six albums, nine Number One songs, three Dove Award nominations and a Dove Award win later, Cheri Keaggy is recognized as a mainstay in the adult contemporary and inspirational genres, and songs like There is Joy in the Lord and In Remembrance of Me are sung in churches worldwide. It has been six years since her last studio album, barring the recently released compilation, The Very Best Of Cheri Keaggy. Good things come to those who wait, and Cheri's seventh offering, Because He First Loved Us, is something to savor. I'm not a great cook, but my family loves it when I fix salmon. I let it soak in this yummy roasted garlic marinade. It takes all day, but it's worth it. I feel like this record is kind of like that. Over the last few years I've been marinating in all kinds of stuff, just trying to listen to God's voice and be obedient, trying to parent intentionally and grow in my relationships. The Christian life can be quite an adventure! These songs are pieces of all of that. From the album's unexpected appetizer, Stay to The Middle , to the sweet resolve of the closing track, The Reason I Stand Tall , Cheri invites us to marinate in the presence of a Holy God, who is both Teacher and Friend. Speak reminds us to listen, and You'll Always Be My Son is a welcome follow-up to the oft requested Little Boy On His Knees . Uncle-in-law Phil Keaggy makes a special guest appearance on the album, contributing the guitar solo on This Is The Love'. All of the songs on Because He First Loved Us are written by Cheri, except for the bonus track, a cover of Carol King's You've Got A Friend, her first duet with lead vocalist Marty Roe of the highly acclaimed country group Diamond Rio. With 13 songs to warm the heart, Because He First Loved Us is a rich blend of poignant lyrics poured out over classic, piano-based instrumentation. And like comfort food for the soul, there is something wonderfully familiar about it. The message of the Gospel is timeless. It never gets old. It's as relevant today as it was 2,000 years ago. I wanted this album to have that quality about it in the production. To fill that order, Cheri teamed up with industry veteran, Tom Hemby. My husband had worked with him through the years at Promise Keepers. Tom had played guitar on some of my other projects. While he's an incredible player, he's also a songwriter. And as a producer, he wants to serve the song and understands that sometimes less is more. The result is a tasteful musical journey that leads us straight to the heart of the message. I wanted to call the album Because He First Loved Us because it's solid. It's the whole reason I sing. I believe 1 John 4:19 is a verse that resonates with the church. We know the world is watching to see if this religion thing is real. How do we treat each other? Does our faith repel the lost or does it attract them to Jesus? Do we love unselfishly even when it's not convenient or easy? Christ did, and He empowers us to do the same. Like her husband did years ago in that high school choir room, Cheri Keaggy continues to invite us to find our significance in Christ, to mature in the faith and to pour out our lives to others so that they might see our good deeds and praise our Father in Heaven. Cheri and her husband, Eddie, live in Nashville, Tenn., with their two teenagers, Cameron (17) and Sarah (15) and their beloved dog, Daisy Doo. Book Cheri Keaggy for your next event! Would you like to have Cheri Keaggy perform at your next corporate event, party or concert? Simply fill out the simple interest form below, and we’ll start the booking process.